Since Until Dawn’s release people have wanted to see what else Supermassive could do within that world. A lot of ideas were floated around, from using the characters in another unrelated story to sequels and prequels. When The Inpatient trailer showed up during the PlayStation VR portion of Sony’s E3 2017 showcase, I had a sneaking suspicion that it was Until Dawn related, and my feelings were quickly confirmed. The Inpatient is indeed set in the same universe as Until Dawn, set 60 years before the killer night that has haunted us for years. The Inpatient is set in Blackwood Sanitorium, yes the same abandoned mental hospital from Until Dawn. Except it’s not abandoned in the 1950s. It’s a fully operational institution, and you are a patient within its walls. True to Supermassive’s original PS4 game, they are exploring a slow and psychological horror that delves into the mind of the patient. The demo showed multiple aspects of The Inpatient. On rails segments where you are strapped to a wheelchair drive horror through a lack of control. Small portions allow you to explore your surroundings using the analog sticks to uncover secrets, but the most compelling part is the psychology sessions with the doctor. These bits allow you to select multiple responses by turning your head to either side. I was told that in the final game, you’ll be able to use the VR headset’s microphone to select these using voice commands. Remember in Until Dawn where you made a crucial decision that created a butterfly effect? Sometimes selecting a response in The Inpatient elicited this same effect because it will have the same branching narrative path. Apparently, these responses that I was giving to the doctor were affecting the treatment that I was getting. It made me think about the various psychology sessions in Until Dawn that attempted to tailor the horror to what scared you the most. It was impossible to show the effects of your choices in the ten minute demo, but if it’s anything like Until Dawn, we could end up seeing the lives or deaths of multiple characters be affected by the things we say or do while committed to the asylum. One of my biggest criticisms with Until Dawn was that the real butterfly effect choices didn’t start coming into play until the latter half of the game due to how the first bit was staged, so I hope The Inpatient manages to make its choices feel meaningful, giving you a reason to look back and regret something you said or did far earlier in the game. Easily one of the most visually impressive PSVR games, The Inpatient drives its terror through psychological means, immersing the player in the eerie unknown and creating an unease that persists throughout. The story of the first was a brilliant thrill ride through multiple horror genres, and The Inpatient has the potential to drop us right in the middle of it all using the virtual reality platform. When I stood up for the short demo, I was visibly shaken, a mixture of emotions flowing through me from confusion to unease and fear. If you know the story of Until Dawn, you know how the story of The Inpatient is likely to end, but with what I saw, I’m convinced there’s even more to Blackwood Sanatorium than the history that we dug up in Until Dawn. Looks like we’re going to have to get admitted to discover those secrets. 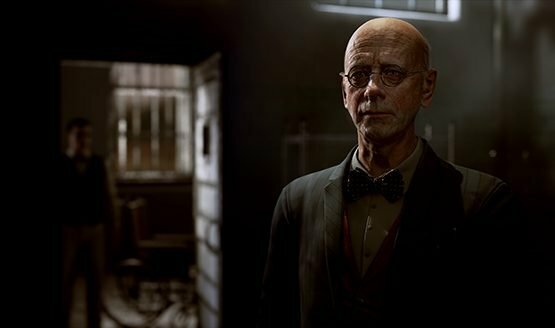 The Inpatient is a PSVR exclusive title set for release in 2018. Check out all of our E3 2017 coverage.